Your last post was the final push in the right direction. First: I never realised that the .svg files never changes when you change something in the plugin. This was some very useful information. I'm using the Dutch translation file, and thats where it goes wrong. 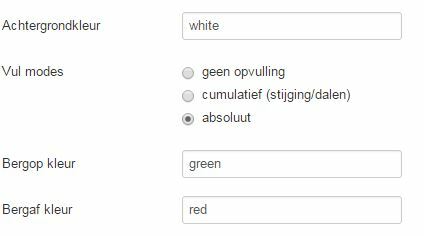 The Dutch discription is very cryptic (it doesn't make much sense at all) I'v changed these settings quite often to see the result, but as I never deleted the .svg files (and Joomla cache), I also never saw any changes in the elevation diagram . And I was (now) using the absolute option.. So now I've deleted all the .svg files, cleared the Joomla cache, changed the fill modus to delta (up/down) --> cumulatief (stijging/dalen) Reloaded the page and Yess!! The colours are all back! By the way: when you change the map control options in the plugin, without deleting the .svg files, this change you will see directly when reloading the webpage. That's odd.. But in the end, we solved the issue! And I've learned more about the plugin settings and behaviour. Thanks (again) for helping me out! could it be that you have set the option "Fill mode"
in the Elevation diagram options to "absolute" instead of "delta (up/down)" ? will be completely green (100% saturation). judging from what you wrote, you have set everything up all right and all should be fine. Is anybody else here facing similar problems after upgrading to J 3.6.4 ? P.S. / EDIT: It's normal and "as expected" that the .svg files are re-created. Last edit: 2 years 5 months ago by fingeradmin. I've played around with that, but it does not solve the issue. For testing I deleted both the .svg files from both the links. Despite the no cahce option in the plugin, the .svg file is still beeing created and to make it more weird: both the elevation diagrams are now green all over ! I'm using the plain HTML color names for it: red and green. I'm really wondering where both the green options are coming from. To me it looks like the plugin is not beeing used / read well by Joomla (3.6.4)? Otherwise the caching option and the colors should be working..
Just thought of something.. the older tracks on the website have been created with an older veriosn of the plugin. Could that be someting? Changing the "Up area Color" and "Down area color" in the Elevation diagram part of the plugin settings will NOT have an effect on diagrams that were already calculated, UNLESS you have set the "Use cached files" option in the Advanced settings to "No". Clearing the Joomla cache will also have no effect, since the pre-rendered .svg files are not in the Joomla cache. They are created and stored in the directory where your .gpx files are (by default: /images/gpxtracks). So to force the .svg diagrams to be rendered with changed colours or other settings, you can just delete the .svg files from the gpxtracks directory and the plugin will re-create them with the current settings. Also make sure you have valid HTML color names or HTML #rgb codes in the "Up area color" and "Down area color" fields. While you are playing around with settings, you can set the "Use cached files" option to "No". That way the .zip and .svg files will be re-created every time you visit (or refresh) the page. b) turn the "Use cached files" option back to "Yes". That way you should have all the diagrams with the same settings. Nothing has changed. I update Joomla and all the plugins all the time. I'm using the latest version of the GPXTrackMap plugin (1.3.3 beta 2) and I'm also using the same GPS device as ever. Strange enough, when I change the colours in the plugin, the colours don't change in the articles. I've cleared all the Joolmacache, browsercahe etc. and tested a lot of things, but I can't figure out what goes wrong.